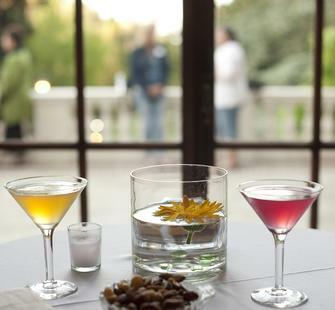 Montalvo Arts Center | Program | Martini Madness! A little bit of revelry—a whole lot of style! These exclusive soirées, featuring delectable appetizers and delicious drinks, are a Montalvo classic. With Martini Madness, you can enjoy delicious food and drink in the Villa's charming solarium or on the front veranda with views to the Great Lawn. Make new friends and loosen up before settling in for the show! At just $35 per person, it’s a great way to make a night of it at Montalvo. *NOTE: These are examples only; actual menu items will vary from night to night. Cocktail hour is from 6:15-7:15pm (for shows starting at 7:30pm) or 6:45-7:45pm (for shows starting at 8pm). Purchase your tickets in advance through the Montalvo box office by calling 408-961-5858, 10am-4pm, Monday–Friday.